The new A6G 54 has virtually the same chassis as the previous model. The engine is derived from the formula two racer with modified valve timing gear (chain), lubrication system (no dry oil sump) etc. In-line six cylinder unit has two spark plugs per cylinder producing 150 bhp. 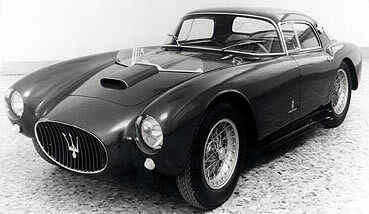 Only 16 of the A6G 2000 were built with bodies by Vignale, Frua, Pinin Farina and Zagato. I crossed to the Maserati stand, where, typical of the Maserati organisation this season, a man was busy finishing off the stand decorations even though the Show had been open for three days. Spaciously displayed were three cars in bright red that would make the most blasé enthusiast sag at the knees. On the left was a two-seater A6GCS sports model exactly as raced by numerous Continental drivers, with no fancy Motor Show frills, just stark reality, while on the right was a similar chassis fitted with a Pinin Farina coupe body, again purely functional and looking as though it was on the starting line at Le Mans. 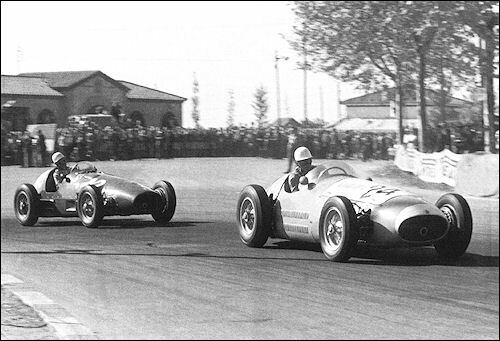 In the centre was a 250/F1 single-seater, the latest to be built and due to be driven at Barcelona by Harry Schell. it was brand new and had obviously not been run at all, and it was interesting to see that the gaggle of oil pipes from the rear-mounted tank had been cleaned up considerably since the Monza race, the delivery and return pipes now being in a neat conduit that passes through the base of the riveted aluminium fuel tank. 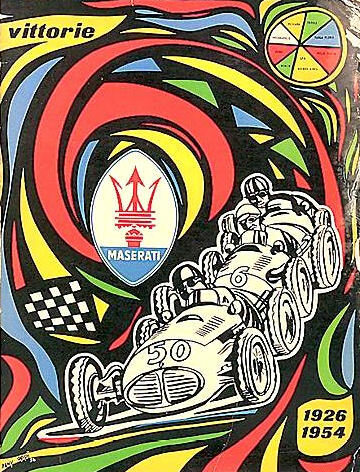 Nicely spaced out with lists of successes in both racing and sports categories, the Maserati exhibits were pur sang personified. 32 Roberto Mieres Roberto Mieres fail. 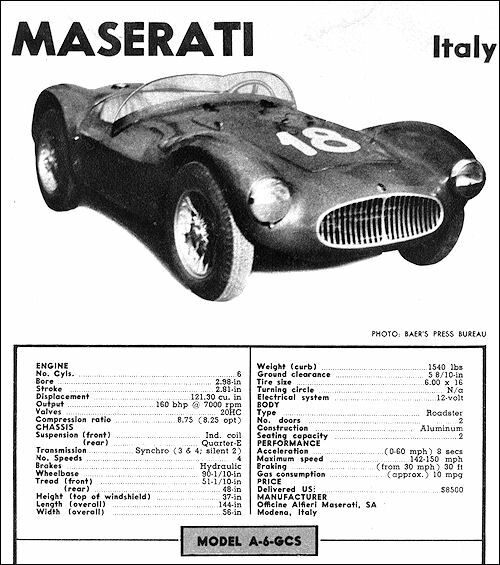 34 A6GCM Maserati A6 2.0 L6 Jorge Daponte Jorge Daponte fail. 36 A6GCM Maserati A6 2.0 L6 Carlos Menditeguy Onofre Marimón fail. 24 Roberto Mieres Roberto Mieres fail. 16 Roberto Mieres Roberto Mieres fail. 42 250F Maserati 250F1 2.5 L6 Ken Wharton Owen Racing Organisation fail. 44 250F Maserati 250F1 2.5 L6 Roy Salvadori Gilby Engineering fail. 48 Harry Schell Harry Schell fail. 5 250F Maserati 250F1 2.5 L6 Roy Salvadori Gilby Engineering fail. 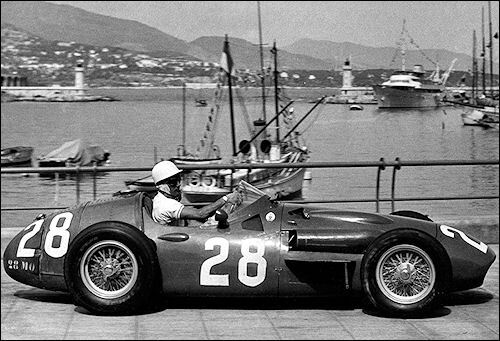 6 250F Maserati 250F1 2.5 L6 Bira / Flockhart Prince Bira acc. 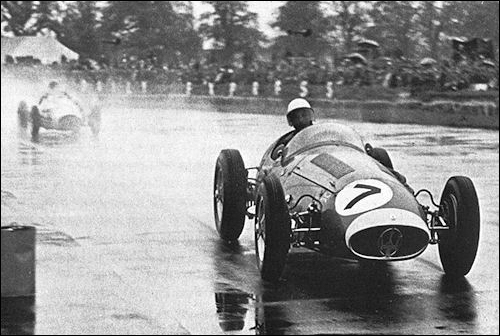 7 250F Maserati 250F1 2.5 L6 Stirling Moss Moss fail. 32 Villoresi / Ascari fail. 8 Roberto Mieres Roberto Mieres fail. 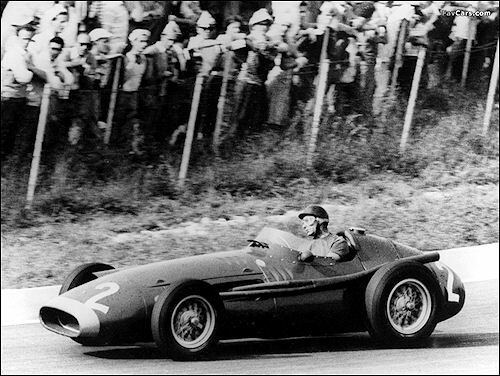 14 250F Maserati 250F1 2.5 L6 Prince Bira Prince Bira fail. 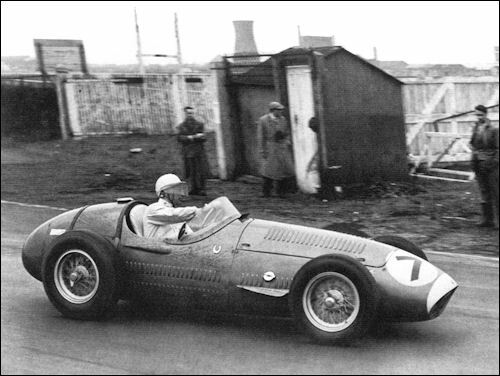 16 250F Maserati 250F1 2.5 L6 Stirling Moss Moss fail. 22 A6GCM Maserati A6 2.0 L6 Graffenried/Volonterio Emmanuel de Graffenried fail. 24 Harry Schell Harry Schell fail. Italian GP, Monza. 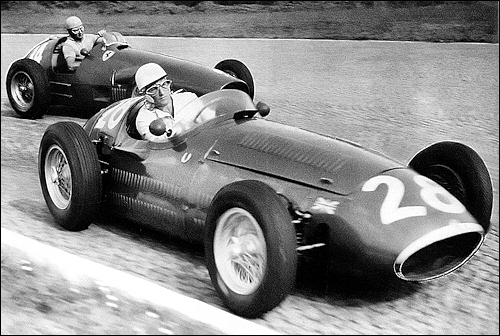 Stirling Moss in the Maserati 250F chased by Alberto Ascari (Ferrari 625). Maurice Trintignant and Harry Schell (Ferrari) at Spanish GP. Stirling Moss at Silverstone International Trophy. OTHER MODELS: SPORT (Coupe 2-Dr.); A6G 2000; 6 cyl; 100 bhp @ 5500 rpm; 99 4/10 in WB; 2100 lbs. 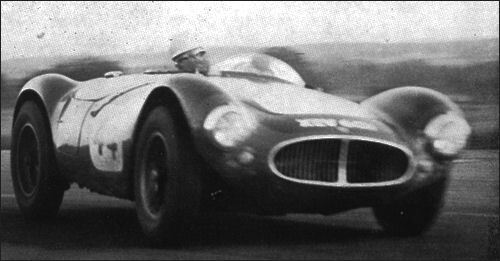 Descended from a long line of pedigree sports-racing and sports-touring cars, the latest 2-litre Maserati A-6-GCS is now the top contender in Class E (1500 to 2000 cc) US sports car competition. The oversquare, twin overhead camshaft engine with three dual-Weber carburetors, is in reality the 1953 Formula II Grand Prix racing power unit, suitably detuned for more versatile use. The close-ratio four-speed gearbox is supplied by a separate oil pump, Grand Prix fashion, and the brakes are essentially those of the Formula II machine. Restyled bodywork now features a different grille, and fenders integral with the sides (as required at Le Mans) in place of the zeus-fastened separate fenders on the 1953 model. Modifications to the chassis frame and front end have resulted in a slight weight increase over last year, but the engine is claimed to develop more power. Only two of these costly, rather stark 1954 machines have so far been imported into the US, but there are customers waiting. Productive capacity of the Maserati Works is limited to some 60 sports and 12 racing cars per year, and the firm has its own bodyshop where every panel is hand-made. However, established custom coachbuilders (Vignale, Bertone) also are called upon-especially for bodies on the A6G, single-cam sports chassis. In the making is a four-cylinder, 1½-litre, twin-cam sports-racing car, slanted directly at the American market. 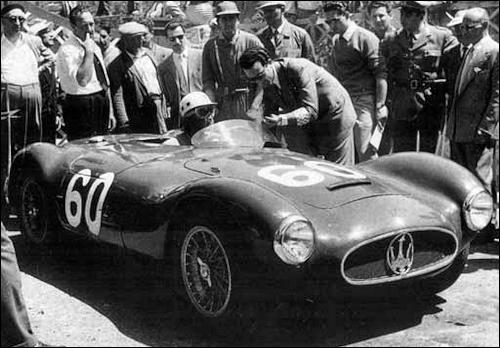 2nd at Targa Florio Maserati A6 GCS/53 (Luigi Musso).